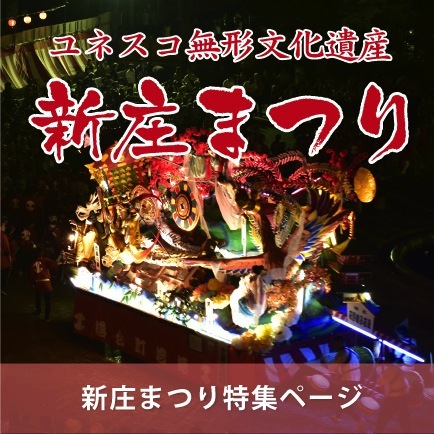 It is the origin and done historical Festival 260 years ago that performed festival so that feudal lord Tadashi Tozawa  (Masanobu) of time keeps hope in citizens of territory depressed to bad crop. Fawn dances (we do and do and jump) that are shinyotogokoretsu (mikoshitogyogyoretsu), culture that best festival car line, ancient rite to give gorgeous decoration, and to compete for gorgeousness in Japan are refined are shown, and it is heroic and does and, for splendid three days, worships, and sound of musical accompaniment wraps up downtown. It was enrolled in the UNESCO Intangible Cultural Heritage with 32 "mountain, pike, stand event" of each places of the whole country groups in 2016. ■Remarks 20 heroic floats which reproduced festival car line, historical picture scroll pay out the highlight with Shinjyo musical accompaniment into city. Lighting changes to fantastic festival car which light, light and shadow weave to festival car on 24th. On 25th, he/she enshrines book. shinyotogokoretsu leaves Tozawa Shrine in Shinjyo Castle ruins. 200 people in all become samurai of Shinjyo feudal clan completely and go round in the city. There is much highlight including wonderful skill of harmonious footwork and umbrella mawashi of common soldier. When shinyotogokoretsu is over, 20 floats line example begins. Magnificence and force of festival car which takes summer sunlight, and gives off vivid ya color are the best part. On 26th, we can see Hagino fawn dance and Nitayama fawn dance to pray for staple grains abundant harvest to come to the Shinjyo northern part for a long time. In addition, all 20 festival cars gather and, in the last of Shinjyo Festival, make the finale decoration festival car. We set up eve, paid seat by 25 Japan Festival on 24th. As free seat prepares for this festival of 25th partly, please use by all means. We take detailed inquiry, application to Shinjyo Festival executive committee.